iTapuih.com - 10 Contoh Soal Procedure Text dan Kunci Jawaban Terbaru. 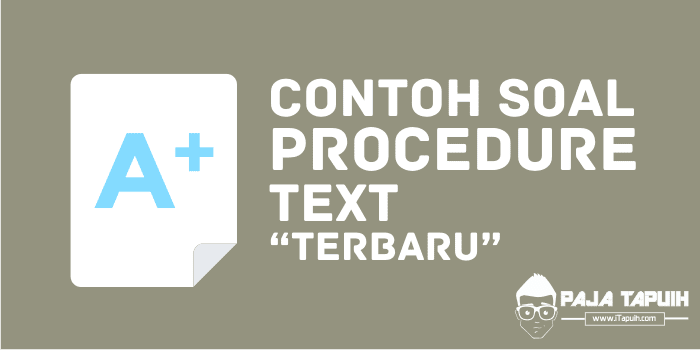 Procedure text adalah salah satu jenis text yang bertujuan menunjukkan kepada pembaca tentang bagaimana cara membuat, menjalankan dan melakukan sesuatu. Secara sederhana text ini juga sering disebut sebagai teks tutorial. Dalam artikel ini saya akan membagikan 10 Contoh Soal Procedure Text dan Kunci Jawaban Terbaru untuk pelajar Sekolah Menengah Pertama kelas 7, 8 atau 9 SMP/MTs. Soal-soal dibawah ini bisa Anda download pada link bagian paling bawah postingan. Read the following text to answer questions number 1 to 3. 1. Shake up the detergent and put it 15 — 20 cm away from the LCD screen. 2. Spray on the LCD screen surface directly. 3. Cleanse gently using the fabric cleanser or brush. 1. Spray the detergent on the fabric cleanser. 2. Clean the LCD screen surface to make it as bright as a new one. 1. What should you do to detergent first? 2. Before cleaning the screen surface, we spray the detergent on the screen surface directly or spray it on …. 3. "Cleanse gently with the fabric cleanser or brush" (step 3). What does the underlined word mean? Read the following text to answer questions number 4 and 5. 1. Remove all frozen foods and ice cube trays. If you have a second refrigerator, use it to temporary store these items. If not, put the food in a cardboard box and cover it with newspaper. Dump the ice cubes. 2. Removes all other food stuff and place on your kitchen counter or in cardboard boxes. 3. Either turn the temperature control "defrost" or unplug the electricity to the refrigerator (or both). 4. Never scrape or jab at the ice with a sharp instrument. You may cause serious damage to the freezing unit. Allow it to melt. 5. Either put a flat pan under the freezer to catch the drips or put a large towel in the bottom of the refrigerator. 4. What should we do after turn the temperature control "defrost"? Read the following text to answer questions number 6 and 7. 1. Turn on the oven 160o C.
2. Lightly grease an oven tray. 3. Mix oats, flour and sugar in a large bowl. 4. Melt butter and golden syrup in a pan. 5. Mix baking soda and boiling water in a cup. 6. Add this mixture to melted butter and golden syrup. 7. Add this to the oats mixture in the large bowl, mix together well. 8. Roll tablespoonfuls of the mixture into balls. Put on the try 5 cm apart. 9. Press lightly on top of each with a fork. 10. Bake for 20 minutes. 6. What is the purpose of the text? 7. Why do we use a fork to make Anzac Biscuits? Read the following text to answer questions number 8 to 10. 1. Choose the size you want. If you want to put longer items, such as a ruler, placed in your pencil case, you'll need a longer pencil case. 2. Find a bag or box that suitable with your choice of size. It doesn't have be nice looking, but strong and clean. 3. Cover the box with paper, any color. 4. Decorate the container. Try some or all of the following ideas. Put on same cool sticker. Decorate with your own art with makers: draw lines, shapes, animals, people, etc. Cut some magazine pictures and stick them on it. Glue on shells, buttons, or anything else you want to decorate the pencil case with. Add glitter if you like. 5. Show all your friends, and be proud of your unique pencil case. 9. From the text above we can conclude that we have to be .... in decorating the box to have a good result. Selamat belajar, semoga postingan tentang 10 Contoh Soal Procedure Text dan Kunci Jawaban Terbaru bisa bermanfaat dan jangan lupa share ya.